I view my role as being a ceremonialist, witness and mirror, reflecting what you want to create for your ideal wedding. I offer options and will send you a script with alternatives for the vows, ring ceremony, poems and blessings, so you can review different phrases and styles. The script is a starting point for your very personal exchange. You might find it suitable as it is, modify it, use a part, or create your own. Consider incorporating your favorite symbols, readings, poetry and anything else that has special significance for you. When you share an experience in ritual, each word should fit so you can be honest and comfortable with what you are saying. Planning can be a unique part of the experience, and it may be a useful process in sharing your values. The important thing is that you are pleased with every aspect of the ceremony. If possible, it is helpful for us to become acquainted and discuss details prior to the wedding; however I have communicated with couples solely through email or phone conversations when distance makes it impossible to meet before the ceremony. My fee is comparable to other celebrants in the area. The wedding will be confirmed upon receipt of a non-refundable $100 deposit. The balance is due ten days before the ceremony. I’ll present the completed script of your ceremony to you after the wedding. 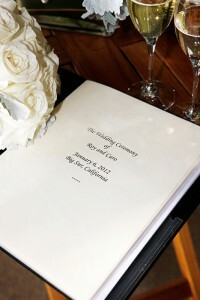 This can be a keepsake for renewing your vows on your anniversary, or simply a remembrance of this very special event. I ask that it be for the highest good.